Remember those big promises that President Trump and the Republican Congress made about their corporate tax bill? President Trump said every worker would receive a whopping $4,000 raise if the bill passed. Corporations made promises, too. AT&T CEO Randall Stephenson was one of the biggest supporters of the Republican corporate tax cut bill and promised to create thousands of good jobs in the U.S. So now that the tax bill has gone into effect, where are those $4,000 raises? Where are those good jobs? It's clear that corporations plan to use their windfall to boost executive pay and reward large shareholders. To hold them to their promises, working people need to join together and fight. That's why CWA's bargaining teams have sent letters to employers including AT&T, Piedmont Airlines, Envoy Air, and Nexstar Broadcasting requesting detailed information on how those companies are using their gains from the largest corporate tax cut in U.S. history. We're working with unions representing nearly 6 million workers including SEIU, AFT, and the Teamsters to hold employers accountable for the promises they made to raise wages and bring jobs back to the U.S. if the tax bill passed. We want to find out how much the companies are benefiting from the tax cut, what portion of those benefits they are using to raise wages and create jobs, and exactly how many jobs have been sent to contractors. We will use the information to bargain for contract changes that raise wages and bring jobs back for our members. Failure to disclose the requested information could subject the companies to an Unfair Labor Practice complaint under the National Labor Relations Act. CWA and the other unions plan to send more letters as they enter into bargaining with other companies. 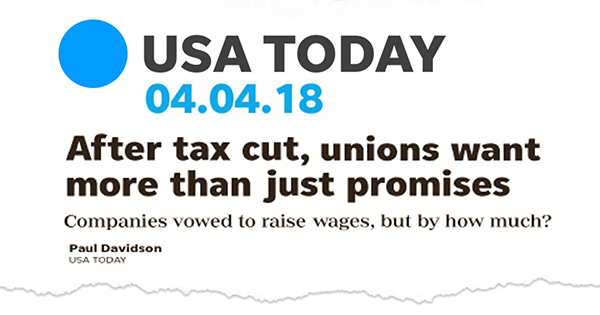 "Working people deserve to know how their employers plan to spend their tax savings so they can bargain for a fair share of the windfall and ensure that corporations do more to bring jobs home and improve pay and benefits," said CWA President Chris Shelton. Our effort to hold corporations accountable for their promises is getting attention from the press, including a featured article in USA TODAY. The Jackson City Council voted unanimously in favor of a collective bargaining agreement between the City of Jackson and MASE/CWA covering about 300 public workers. Alaska Airlines Flight Attendants represented by AFA-CWA approved a joint collective bargaining agreement covering more than 5,700 Flight Attendants at Alaska Airlines and former Virgin America. "This contract is significant because it's a first for the former Virgin America Flight Attendants and provides pay and work-life improvements for all Alaska Airlines cabin crew. Not only is this a step forward for the 5,700 Flight Attendants at Alaska, but it also raises the bar for all Flight Attendants in the industry with more than 1,200 families newly benefiting from a union contract. Flight Attendants across the industry are cheering this step forward for our careers," said Sara Nelson, AFA International President. The agreement provides contractual improvements and pay increases for pre-merger Alaska Flight Attendants, immediate parity on pay rates for pre-merger Virgin America Flight Attendants, and significant enhancements in maternity leave, schedule flexibility, and work rules. 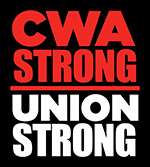 Have questions about what's going on in CWA bargaining with AT&T Midwest and Legacy T? Next Tuesday, April 10, at 7:00 p.m. Eastern, hear from CWA President Chris Shelton, D4 Vice President Linda Hinton, T&T Vice President Lisa Bolton, and the Bargaining Chairs of the two committees on a town hall call. Members will have an opportunity to ask questions. As negotiations continue, read the latest bargaining reports from CWA District 4 and AT&T Midwest here, and updates from CWA Legacy T and AT&T here. A new, chilling video is making the rounds on the Internet, showing anchors from numerous local news networks owned by the conglomerate Sinclair Broadcast Group being forced to parrot right-wing talking points about "fake news" that could be taken straight from President Trump's Twitter feed. If the name Sinclair Broadcast Group sounds familiar, it might be because CWA has been fighting hard over the past year against an attempted merger between Sinclair and Tribune Media. The merger would result in one company becoming the largest owner of local broadcast stations in the country, with more than 220 stations in 108 markets. This would extend the reach of Sinclair from 38 percent of U.S. television households to 72 percent. The Sinclair-Tribune merger remains under review at the Department of Justice and the Federal Communications Commission. "Sinclair has a long history of cutting jobs when it acquires stations, which means more pre-packaged segments and cookie-cutter scripts and less local news coverage that reflects the concerns and interests of the communities that these stations serve," said Charlie Braico, President of NABET-CWA. "This video is the latest evidence of what I and many others have been saying for months: the Sinclair-Tribune merger is not in the public interest and should be denied." Sign a petition to stop the Sinclair-Tribune merger here. Unfortunately, Sinclair is not an isolated case. In another disturbing demonstration of the dangers of big corporations buying up local media outlets, the secretive hedge fund Alden Global Capital has been quietly buying up newspapers around the country, many employing NewsGuild-CWA members. Its executives are stashing money in notorious tax havens worldwide and operating a complex web of funds and business structures to hide their investors from public view. Under Alden's reckless management at the U.S.'s second-largest newspaper chain, Digital First Media, newspaper staffing levels have been slashed to the bone. In many cases, Alden is laying off the very journalists who otherwise would investigate and expose this kind of business conduct. Journalism is vital to a healthy democracy, and transparency is essential to accurate, independent reporting and public trust in the news media. Despite their best efforts, Alden's shady actions are being exposed by diligent reporters. Investigative journalist Julie Reynolds, who formerly worked at the DFM-acquired Monterey Herald, has been reporting in great depth on Alden for the past few years for #NewsMatters, a project of NewsGuild-CWA. She recently reported that Alden is now facing a lawsuit for siphoning hundreds of millions of dollars from Digital First Media to finance insider investment deals, damaging local news organizations. Read the piece here. Bloomberg recently published a deep dive into Alden's harmful practices here. IUE-CWA Local 83711 in Gadsden, Ala., represents workers at Inteva Products, a global automotive supplier. The members of Local 83711 have been working hard on their internal organizing over the past year to make IUE-CWA STRONG. The local has created a mobilizing committee to get out and talk directly to members about why it's important to be a member and to be active in the union. The committee has made great strides in getting more members engaged. Through regular conversations with members and non-members alike, local activists have signed up more than 30 new members and developed new member activists now taking the union message of power and solidarity to their coworkers. The local's organizing efforts have not gone unnoticed. As the union has grown stronger at the company, previously rigid and standoffish management has taken a more respectful and open approach to its relationship with the union. The company is now allowing regularly scheduled staff visits into the plant, and the committee has been able to have one-on-one conversations with more than one-third of the members. Local 83711 President Lisa Carroll has identified several new leaders in the plant who are effectively moving the campaign forward and building stronger relationships with their coworkers. "It's hard work, but in the long run it pays off, because we are able to get more members involved," Carroll says. Local 83711 is a great example of the dividends that come from fighting to build power at work, and they are continuing their hard work to make IUE-CWA STRONG. On the 50th anniversary of Dr. Martin Luther King, Jr.'s assassination, the I AM Conference in Memphis, Tenn., brought together thousands of labor leaders, civil rights activists, and other allies to develop strategies to ensure that all working people are treated with dignity and respect. As part of the conference, CWA President Chris Shelton, District 6 Vice President Claude Cummings, CWA Civil Rights Director Melissa Matos, CWA members from Local 3806 and 3808 in Tennessee, and CWAers from Districts 1, 6, and 9 marched to the Mason Temple where MLK delivered his iconic 1968 "I've Been to the Mountaintop" speech in support of striking Memphis sanitation workers. King's 1968 speech centered around economic and social justice, a battle that union members continue to fight each and every day. CWAers joined thousands of labor leaders, civil rights activists, and other allies at the I AM Conference in Memphis, Tenn., to commemorate MLK's legacy for working people.